Medical Services Department 1, Chairman and Managing Director 2, Troikaa Pharmaceuticals Ltd., Ahmedabad, Gujarat, India. ABSTRACT: Topical NSAIDs do not effectively cross the skin due to barrier of stratum corneum. The aim of the study was to evaluate penetration of diclofenac from a novel quick penetrating solution (QPS) and conventional gel prepared using Tc-99 m labeled diclofenac. The study was conducted in 16 healthy subjects, divided in 4 groups, each with 4 subjects. In first three groups, the applications were made on knees for 30, 60 and 120 minutes respectively. In fourth group, applications were made at six sites (three on either side of the spine) on the back. Equal quantity of diclofenac from QPS and gel were applied on left and right knee and left and right side of the spine respectively. Measurement of radioactivity was done by gamma camera after washing of the applied drug. It was found that the penetration of radiolabeled diclofenac increased with increase in application time for both the QPS and gel formulations. Scintigraphy images indicated site specific differences in the rate and extent of penetration. Over knee, the penetration of diclofenac from QPS was significantly higher as compared to gel after application for 30 min (P<0.0001) and 120 min (P = 0.03). Over back, the difference in the % retention was significant (P = 0.03) after 60 min of drug application. Thus, it may be concluded that both rate and extent of diclofenac penetration from skin over knee and back from QPS was higher than gel. Currently available topical formulations of diclofenac include creams, gels or aerosol sprays. To provide adequate analgesic effect, topically applied drugs should cross the barrier of stratum corneum to reach the underlying tissue.4 It is reported that only 10% of diclofenac from the topically applied gel is biologically available.5 A meta-analysis of 25 randomized clinical trials shows no benefit of topical NSAIDs over placebo at four weeks in treatment of osteoarthritis 6. The failure of currently available topical formulations in providing effective pain relief mandates the use oral NSAIDs 7 and pose the need of newer topical formulation with enhanced penetration property. A novel non-aqueous topical solution of diclofenac was formulated using QPS (quick penetrating solution) technology in which drug is dissolved in a unique base which contains penetration enhancers. This helps to overcome the barrier of stratum corneum and provides quick and enhanced penetration of the drug through the skin. The enhanced penetration results in increased drug concentration in the underlying tissues providing adequate local analgesic effect. The objective of this study was to evaluate the penetration of radiolabeled diclofenac through the skin of knee and back after topical application of diclofenac diethylamine 4.64% quick penetrating solution (QPS) and diclofenac diethylamine 1.16 % gel in healthy adult male subjects using gamma scintigraphy. This prospective, open label, comparative scintigraphy study was conducted at Department of Nuclear Medicine, Institute of Nuclear Medicine and Allied Sciences (lNMAS), Delhi, India. The study was initiated after approval by the Independent Ethics Committee. The study was conducted in accordance with the Good Clinical Practice (GCP) guidelines issued by the Central Drugs Standard Control Organization (CDSCO) India; the ethical standards laid down in declaration of Helsinki 1964 and its later amendments and the Ethical guidelines for biomedical research on human participants issued by Indian Council of Medical Research (2006), New Delhi. Diclofenac diethylamine (DEA) was labelled with Technetium-99m (Tc-99m) in dry form (by Dry Powder labelling protocol developed by INMAS). Stability of the radio labelled DEA was confirmed in-vitro. The radiolabelling efficiency of the process was more than 95%. Radiolabeled DEA was used to prepare QPS and gel formulations freshly on the day of the study. All subjects were explained the procedure and written informed consent was obtained before the screening procedure. 16 healthy adult male subjects aged 18 to 55 years, without any sign of abrasion, wound or infection on the skin over knee and back and with normal clinical examination, laboratory examinations and vital signs were included in the study. 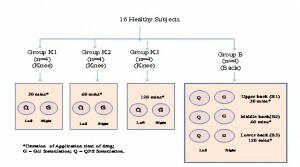 Any subject with known hypersensitivity to Diclofenac or medical history of significant dermatological diseases or conditions known to alter skin appearance or physiologic response or any other systemic illness in past 3 months, history of asthma, gastric or duodenal ulcer, abnormal liver or renal function tests were excluded. The subjects were divided in 4 groups with 4 subjects in each group. The first three groups were named as K1, K2, K3 (knee skin) and fourth group was named as group B (back skin) (Fig. 1). FIG. 1: METHOD OF STUDY DRUG APPLICATION. 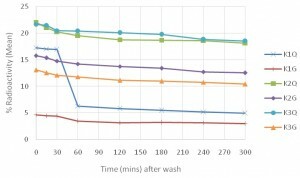 The formulations were washed completely after 30 min in group K1 and B1, after 60 min in group K2 and B2, and after 120 minutes in group K3 and B3. 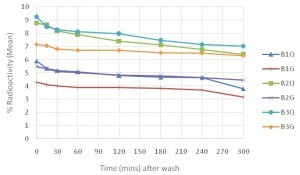 The washing was performed 3 times with a towel impregnated with detergent solution to ensure complete removal of radioactivity and also avoid smearing of formulation in the adjoining area. Scintigraphy images: Anterior and posterior scintigraphy images of all application sites were taken by Symbia 2T dual Head SPECT-CT (Siemens) gamma scintigraphy machine immediately after application of drug, immediately after washing study drug (considered 0 min), 15, 30 minutes and 1, 2, 3, 4 and 5 hours after washing the application. Images were analyzed quantitatively using Region-of-interest software. Radioactivity from the images taken immediately after application of formulation was considered as baseline (100%). Radioactivity of the sites at various time points, post-washing were compared with corresponding baseline radioactivity and recorded as % of radioactivity. Radioactivity in images taken immediately after washing was treated as % diclofenac penetrated through the skin; and radioactivity at subsequent time points were treated as % retention of diclofenac. Study subjects were observed for the occurrence of any adverse event during the study period. Vital signs were recorded at beginning and at the end of study. Statistical analysis was carried out using Student’s t test. P<0.05 was considered as “statistical significance”. Values are expressed as Mean ± Standard deviation (SD). All 16 subjects completed the study and data was subjected to statistical analysis. The formulations were applied on the knee and back as shown in Fig. 2 and 3. These figures depict gamma camera images superimposed in the body outline and show the site and area of drug application. The diclofenac penetrated through the skin at the knee from both QPS and gel formulations. Fig.4 and Table 1 depicts % radioactivity of diclofenac at the site of application in group K1, K2 and K3 at different time points. The radioactive density of diclofenac, at skin over knee, was increased with increase in application time for both the QPS formulation and gel formulation. The penetration of radiolabeled diclofenac, on the skin over knee from QPS formulation was higher than gel formulation for images taken at all time points, post wash, in K1, K2 and K3 groups. It was statistically significant as compared to gel formulation in group K1 (P<0.0001) and group K3 (P = 0.03). The levels declined with time in all groups. The parallel lines in the Fig.4 suggest that the apparent rate of disappearance of radioactivity was similar in all the groups. Penetration at Back: The diclofenac penetrated through the skin at the back from both QPS and gel formulations. Fig.5 and Table 2 depicts % radioactivity of diclofenac at the site of application in group B1, B2 and B3 at different time points. The radioactive density of diclofenac, at skin over back, increased with increase in application time for both the QPS formulation and gel formulation. The penetration of radiolabeled diclofenac, on the skin over back from QPS formulation was higher than gel formulation for images taken, post wash, at all time points in B1, B2 and B3 groups. It was statistically significant in group B2(P=0.03). The levels declined with time in all groups. The parallel lines in the figure suggest that the apparent rate of disappearance of radioactivity was similar in all the groups. Values are expressed as Mean± SD. Data were analysed by unpaired t test. N= number of subject in each group. None of the subject had any adverse event during the entire study period. Results from this study suggest that penetration of diclofenac increased with increase in duration of application with both formulations; this suggests that for adequate effect topically applied drugs should be allowed to stay for sufficient time. However, the penetrability of the drug is dependent on the type of formulation as well as thickness and texture of the stratum corneum at the site of application as reflected by the relative positions of plots of QPS and Gel in Fig. 4 and 5. The % penetration of diclofenac achieved with QPS formulation at 30 min at skin over knee (17.2 ± 1.25) was higher than that of gel formulation after 30, 60 and 120 min of application (4.67 ± 1.70, 15.76 ± 6.53 and 13.10 ± 5.15 respectively) (Table 1 and 2). This denotes faster rate and higher extent of penetration of diclofenac from QPS. The extent of diclofenac penetrated from QPS was almost 4 times higher as compared to gel at skin over knee (17.04 ± 1.04 vs 4.49 ± 1.70; p<0.05) in group K1 (after 30 minutes of application). However, this difference in penetration was 1.62 times higher at the back (8.629± 1.77 vs 5.295 ± 1.46; p<0.05) in group B2 (after 60 minutes of application) (Table 1 and 2). The lesser rate and extent of penetration of drug at back as compared to knee could be due to variation in thickness of stratum corneum at two different sites. Radioactivity at application site disappeared gradually after washing till the last measured time point (5 hrs). The apparent rate of loss of radioactivity was similar at both sites and from both the formulations. Parallel lines in the figures suggest that formulation or the site of application has no effect on disposition of diclofenac. In K1 group, the radioactivity levels from QPS formulation at 300 minutes were still higher than the observed at 0 min with gel formulation. Similar observations were made in group B2 for QPS and gel formulations. This may translate in to faster pain relief for longer duration with QPS formulation. This can be explained by initial high tissue levels achieved by QPS formulation. This finding also suggests that over back skin, more time is required than over knee skin for adequate penetration. This information can be useful in deciding time duration of application in future studies. This scintigraphy study suggests significant penetration (faster and higher penetration) of diclofenac from QPS through the skin of knee. The results of this study suggest that the topical formulation with enhanced penetration can be useful in treating musculoskeletal and joint diseases adjacent to the skin. 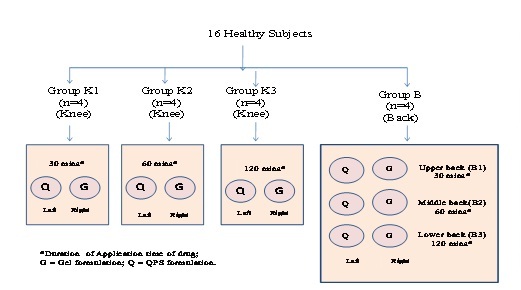 We recommend conducting clinical trial in patients suffering from OA knee to evaluate the clinical efficacy of QPS whether its increased penetration can provide better pain relief or can reduce the need of oral NSAIDs. CONCLUSION: This comparative Scintigraphy study suggests that the topical application of quick penetrating solution of diclofenac results in increased penetration of diclofenac through skin over knee and back as compared to conventional diclofenac gel. ACKNOWLEDGEMENT: This study was sponsored by Troikaa Pharmaceuticals Ltd., India. Nair B and Taylor-Gjevre R: A Review of Topical Diclofenac Use in Musculoskeletal Disease. Pharmaceuticals 2010; 3:1892-1908. Argoff CE and Gloth FM: Topical nonsteroidal anti-inflammatory drugs for management of osteoarthritis in long-term care patients. Therapeutics and Clinical Risk Management 2011; 7: 393–399. Folzer E, Gonzalez D, Singh R and Derendorf H: Comparison of skin permeability for three diclofenac topical formulations: an in vitro study. Pharmazie. 2014 Jan; 69(1):27-31. Chiranjib DB, Chandira M, Jayakar B and Sampath KP: Recent advances in transdermal drug Delivery system. International Journal of Pharm Tech Research 2010; 2(1):68-77. Cevc G and Blume G: New, highly efficient formulation of diclofenac for the topical, transdermal administration in ultradeformable drug carriers, Transfersomes. Biochimica et Biophysica Acta. 2001 Oct 1; 1514(2):191-205. Lin J, Zhang W, Jones A and Doherty M: Efficacy of topical non-steroidal anti-inflammatory drugs in the treatment of osteoarthritis: meta-analysis of randomised controlled trials. BMJ 2004; 329: 324. Frech EJ and Go MF: Treatment and chemoprevention of NSAID-associated gastrointestinal complications. Therapeutics and Clinical Risk Management 2009; 5:65-73. Campbell CSJ, Contreras-Rojas LR, Delgado-Charro MB and Guy RH: Objective assessment of nanoparticle disposition in mammalian skin after topical exposure. Journal of Controlled Release; 2012; 162(1):201-207. Towheed TE: Pennsaid therapy for osteoarthritis of the knee: a systematic review and metaanalysis of randomized controlled trials. J Rheumatol. 2006; 33:567-573. Casilda M Balmaceda: Clinical trial data in support of changing guidelines in osteoarthritis treatment. 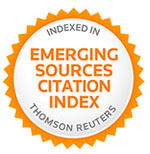 Journal of Pain Research 2014; 7:211–218. Maroo S, Patel KR, Prajapati V, Shah R, Bagul M and Ojha R: A Comparative Dermal Microdialysis Study of Diclofenac QPS versus Conventional 1% Diclofenac Gel. 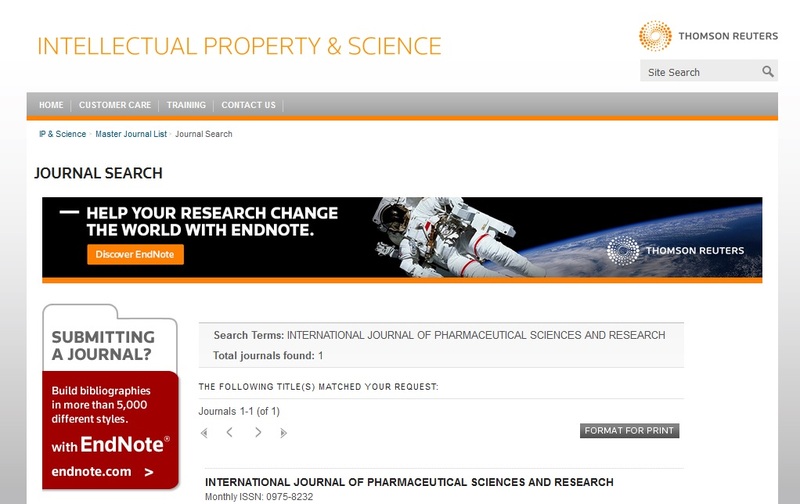 International Journal of Pharmaceutical Sciences and Drug Research. 2013; 5(3):175-178. Pradhan CV, Talesara JM, Sharma A, Panchal VH, Ramanathan S, Patel KR, Maroo S and Ojha R: A Novel Quick Penetrationg solution of Diclofenac (Topical) for Management of Acute Musculoskeletal Pain . Int J Res Med. 2013; 2(2):103-108. Maroo SKH, Bhatnagar A and Patel KR: Penetration of Diclofenac from Novel Quick Penetrating Solution. A Comparative Scintigraphy Study With Gel. Int J Pharm Sci Res 2015; 6(5): 1936-42.doi: 10.13040/IJPSR.0975-8232.6(5).1936-42. Authors Address: Sr. General Manager Medical Services Department, Troikaa Pharmaceuticals Ltd., Commerce House, Opp. Rajvansh Apartment, Satya Marg, Bodakdev, Ahmedabad - 380054 Gujarat, India.